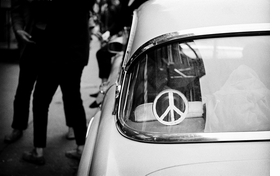 Photographing across America, Jim Marshall charted the life of a symbol, documenting how the peace sign went from holding a specific anti-nuclear meaning to serving as an internationally recognized symbol for peace. It’s a book for a new generations of activists. 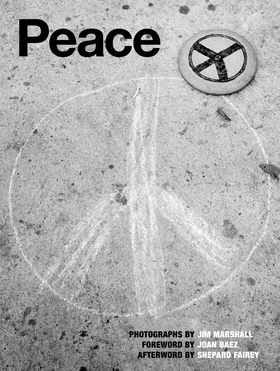 Photographer Jim Marshall’s poignant, thoughtful and unseen photographs of Gerald Holtom’s peace symbol in action have been collated into a new book, aptly titled 'Peace'. The peace sign was inescapable — and truly a sign of its time. 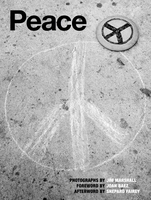 ...hundreds of images of 60s peace signs, by rock’s most prolific photographer...His portraits capture a young generation both repulsed and galvanized by the politics of its time: opposed to war, racism, police brutality, and censorship and committed wholeheartedly to peace. 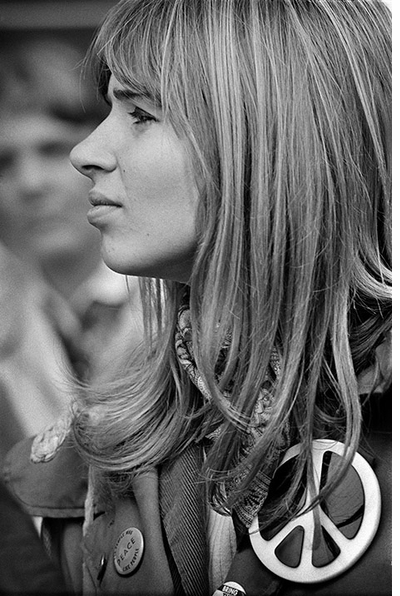 Jim Marshall is best known for his photographs of musicians in the 1960s and ’70s, which capture the style and flavor of the times along with iconic performances. 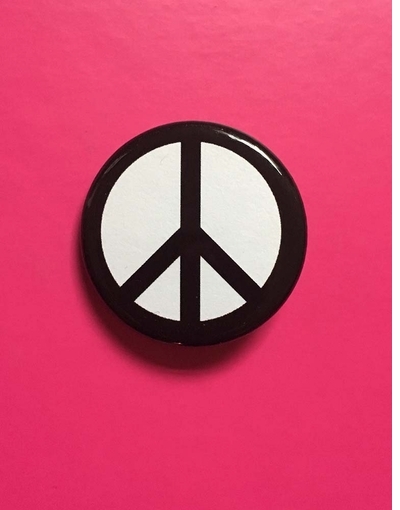 But as Peace, a new book published recently by Reel Art Press, shows, Marshall’s focus extended beyond performers and events such as the Newport Folk Festival to the era’s most ubiquitous symbol, the peace sign. In searching for peace in the 1960s, Marshall … captures the tender emotion — the anger and fraught optimism — that bubbles at the surface of resistance. 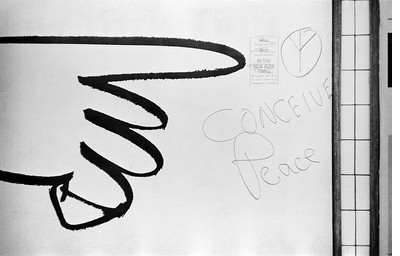 No wonder, then, that early in its adoption as an emblem of anti-nuclear sentiment in America, [the peace symbol] should capture and hold the attention of photographer Jim Marshall. He recognized its cultural significance, and was intrigued by the symbol’s ability to morph between causes, and evade strict definition. 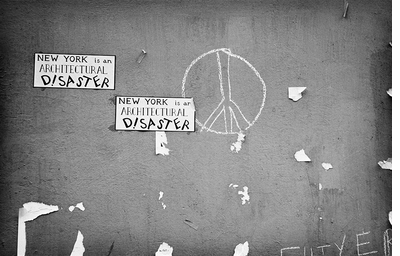 Regardless of the ostensible subject of his photographic assignments, he documented the symbol’s appearance on subway walls and street posters, on political banners and in hippie collages. At one moment, it might be the central motif of a protest march or campus demonstration; at another, it acted almost as a secret code for those with the same political leanings. As these pages illustrate, it could be found at jazz or folk festivals; in urban squalor or festive display; linking anti-war and anti-nuclear campaigners with those who simply refused to belong to LBJ’s ‘Great Society’. 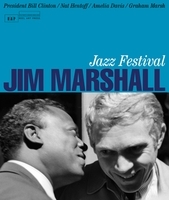 The juxtaposition of individual photographs and contact sheets in this book reflect the breadth of Jim Marshall’s interest, the keenness of his eye, and the way in which diverse cultural strands merged into one turbulent landscape in 1960s America of the 1960s. Amelia Davis, herself an award- winning photographer, worked closely with Marshall, and now curates and controls his archive. ‘He had immense curiosity’, she recalls. ‘You can see it in these contact sheets. He was always looking beyond. Another photographer who was on assignment to shoot the Newport Folk Festival would have concentrated solely on that task. But Jim always had his eyes open, to see what else was happening around him.’ She compares his contact sheets to a writer’s notebooks: an opportunity to see the fertile mind of an artist in the art of creation. Under Marshall’s gaze fell legendary musicians such as Ray Charles and Bob Dylan; homeless refugees from 1960s consumerism; and, never far from hand, the peace symbol, and those who carried it with pride. ‘Jim is still under-appreciated as a photo-journalist,’ Amelia Davis says. ‘His philosophy was that he was a historian with a camera. His success as a photographer of jazz and rock’ n’ roll musicians means people always assume that was the only thing he did. But he was a master of his art. It astonishes me that he took these photographs using a completely manual Leica. That was a difficult camera to use, and yet he was brilliant at capturing a moment in time – whether that was a live performance, or simply something he saw on the streets or in the subway.’ The Peace project is a testament to his vision and his technical genius; and also a vivid evocation of a symbol, and a sensibility, that survived the turmoil of a remarkable decade. The social and political advances that resulted from that decade, hardwon by those who took to the streets with banners and peace symbols aloft, seemed to be set in stone. For those who participated, it must have seemed impossible that the campaigns against militarism, imperialist adventurism, racism, sexual discrimination and the madness of nuclear proliferation would ever have to be fought again. But in these increasingly unsettled and alarming times, all the old certainties are under question and threat. Even the ultimate horror of a nuclear apocalypse is once again shadowing our world, while freedoms that have been accepted as natural for decades are being overturned and undermined. FORMAT: Hbk, 6.75 x 9.25 in. / 128 pgs / 120 b&w.